My 10th great grandfather, Samuel Morse (1576 – 1654) arrived on board the ship Increase in 1635 with his wife, Elizabeth, a son Joseph, and “Elizabeth Daniel”, age 2, a granddaughter. His living children followed him to Massachusetts but were not listed on the Increase. The English origins of Samuel and Elizabeth have been written up in journals. Samuel Morse is the son of Rev. Thomas Morse of Foxearth Essex, and his wife Elizabeth Jasper is the daughter of Lancelot Jasper and Rose Shephard of Suffolk. See below for the journals with their English origins. Upon arriving in New England, Samuel and Elizabeth Morse first lived in Watertown, and in 1636 Samuel and his sons Joseph and Daniel were each granted twelve acres in Dedham. In 1640 he was admitted to the church in Dedham, and a few months later he became a freeman. 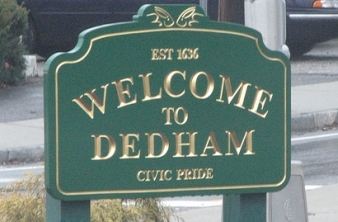 He was one of the original nineteen settlers of Dedham. The inventory of his estate calls him “Samuell Morse of Medfield, lately deceased”. His will mentions his wife Elizabeth, John Morse, Daniell Morse, Mary Bullin & Ann Morse “the wife of my dearly beloved son Joseph deceased, who with my said children shall have an equal portion”. The will was witnessed by two neighbors and Samuel Bullin, my 9th great grandfather, husband of Mary, the youngest Morse child. The English origins of Samuel Morse were written up by G. Andrews Moriarty in The American Genealogist, Volume 24 (1949), pages 147 – 156. A sketch of Samuel Morse by Robert Charles Anderson in The Great Migration: Immigrants to New England 1634 – 1635, Volume V, pages 170 – 177. The English origins of Elizabeth (Jasper) Morse were written up by Myrtle Stevens Hyde in The American Genealogist, Volume 62 (1987), pages 235- 40. Generation 1: Samuel Morse, son of Rev. Thomas Morse, baptized 12 June 1576 in Boxted, Essex, England, died in Medfield, Massachusetts 5 December 1654; married on 29 June 1602 in Redgrave, Suffolk, to Elizabeth Jasper, daughter of Lancelot Jasper and Rose Shepard. She was baptized on 30 January 1579/80 in Redgrave, and died on 20 June 1655 in Medfield. Seven children. Heather Wilkinson Rojo, “Surname Saturday ~ Morse of Dedham and Medfield, Massachusetts”, Nutfield Genealogy, posted May 26, 2018, ( https://nutfieldgenealogy.blogspot.com/2018/05/surname-saturday-morse-of-dedham-and.html: accessed [access date]). From Samuel (my 10th gr grandfather) to his son Joseph to Samuel Morse 1639-1717 to Joshua Morse (1677-1749) to Zipporah Morse (1702-1780) who married Samuel Smith (1697-1753) in Needham, MA. Olive May Lougee (1883-1956) married Willard Holt Eldredge (1882-1957) - Willard was also a descendant of Martha Eldredge Smith's brother, Jesse Eldredge. Lester Fremont Eldredge (1909-1991) was my grandfather. Heather. I have known for a long time that we would eventually be connected. As soon as I saw the name Samuel Morse, I was sure he would be my husband's line. And BINGO! He is. Samuel Morse and his wife Elizabeth are my husband's 9th great grandparents. Descended through their son, Joseph. I knew all your Massachusetts and New Hampshire ancestors just had to connect with my husband's line somehow. How exciting! I'm descended from Samuel through his son Joseph. Bill - that makes you and my husband, cousins.